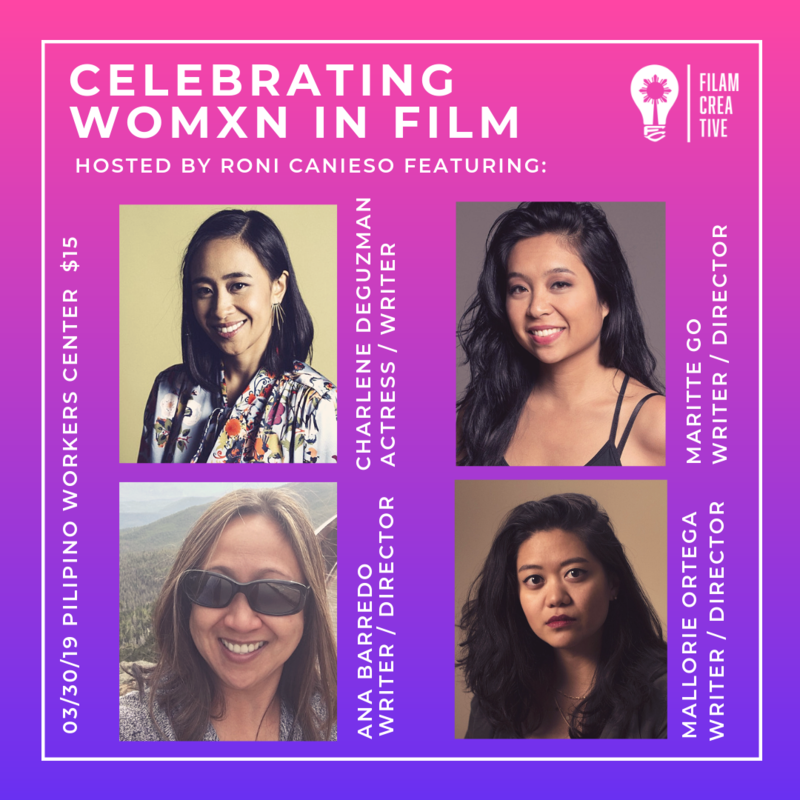 When our amazing FilAm Creative team pitched the idea of doing a panel to celebrate womxn in film, I was elated. When I was asked to moderate, I was over the moon. Hosting a panel where Filipino womxn in the industry can discuss their insights and share their stories is a dream come true. But ask 18-year-old me, bright-eyed, pretentious, and just about to start film school, I would’ve thought it was a nightmare. Most of my adolescence was spent scoffing at the pretty, skinny, Asian girls on T.V. Because, at this time, they were so few and far between. So I thought that every Brenda Song, Mindy Kaling, and Vanessa Hudgens meant only one thing: that there would not be enough room for me. For every brown girl that I saw on the screen, there was one less job I could apply for, one less role I could play, one less story I could tell. I didn’t want to see other brown girls succeed. I was convinced that there was a group of men sitting in a room somewhere deciding that T.V. and movies were at some sort of “Brown Girl Maximum Capacity”. If you are a womxn of color, you know this feeling too well. You know the feeling of when you’re constantly being judged and encouraged to catfight for your life. That there could only be one of us to represent the whole of us. This is especially true in an industry that is infamous for not being inclusive to women of color. We are often both excluded in the room and in the conversation, unable to accurately represent ourselves. As for being Filipino too? In a nutshell, I’m an immigrant who wasn’t old enough to remember coming to America and can’t speak Tagalog. I’ve had members of my immediate family tell me I wasn’t “Filipino” enough. How could I even represent this culture? How would my perspective or my stories even matter to my Kababayan? Would they even see me as such? So there I was, ridiculously insecure, in an endless competition between other womxn, and wrestling with the validation of my own identity. Just another brown girl already defeated before she’s even shown up for the fight. Little did I know, this was the class that began the shift in my perspective. It was here that I learned about a few little ideas called representation, intersectionality, and sisterhood. What radical notions these were! The idea that we as womxn can exist to tell our own stories, that we can identify as many ways as we need to, and that we can encourage each other, work together, and not bring each other down! We can be anything we want: women, womxn, womyn or neither of these! If some mysterious group of men was deciding that the room had too many brown girls, then I’d have the strength and savvy to get up and leave. I’d go to the room where I was not only welcome, but I was celebrated. Which brings me to now. As a writer, producer, and FilAm Creative’s Vice President, I now feel welcome in my craft. My work feels at home, nestled in the intersectionality of my own distinct cultural experience. I can see, and determine my own value. For this, I can thank other writers, directors, and filmmakers, like our panelists. I can thank the courageous womxn of color who boldly went against the status quo, and decided to work together, instead of putting each other down. I can now proudly admit, that I can name several filmmakers who are not only womxn but Filipino as well. I’ll be saying their names a lot on Saturday, March 30th at the Pilipino Worker’s Center. Without an ounce of shame, I admit that once upon a time, I didn’t value other womxn, my culture, or myself. It is now my honor and privilege to be hosting this landmark event with a stellar panel of trailblazing womxn. I’m filled with pride to see how far we’ve come. Please join me and FilAm Creative in recognizing the achievements of these filmmakers. It’s time to celebrate.